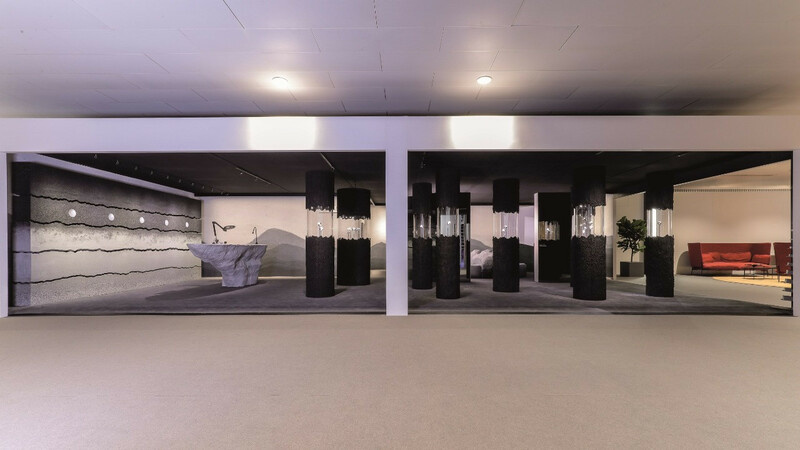 Audemars Piguet, a Swiss haute horlogerie manufacturer, unveiled its latest lounge within Art Basel Hong Kong’s collectors lounge this year. According to a press release sent to The Jakarta Post, the lounge was designed by contemporary artist and designer Fernando Mastrangelo, who is known to specialize in sculpture, furniture, architecture and interior design. Titled the Vallee, the lounge is made of minerals extracted from the Jura Mountains, home of Audemars Piguet. The minerals were cast and repurposed into walls, display cases and furniture. Meanwhile, a forest crafted from sand and silica-molded spruce trees was placed at the center of the lounge. Examples of the brand’s latest collection such as Code 11.59 and also unconventionally designed vintage watches were displayed in the “forest”. Another highlighted feature of the lounge is the watchmaker’s desk in the technician’s corner, standing in front of the “strata wall”. The wall of strata, an interpretation of the Combe Noire quarries at the Vallee de Joux in the Jura Mountains, displays five components, namely gold, brass, aventurine, sapphire glass and iron, said to be part of the brand’s latest collection. Mastrangelo said in the press release that it had been rewarding to work with the team that created the Audemars Piguet lounge. He also said the natural beauty of Audemars Piguet’s Swiss home, as well as its watchmakers’ technical mastery, left him awestruck. “Material elements are integral to [Audemars Piguet’s] roots and at the core of my practice. The result is a design that experiments with forms, materials and textures and creates a universe inspired by the Vallee de Joux,” Mastrangelo said of the lounge design. Other parts of the lounge were influenced by the brand’s latest collections and commitment to nature and creativity. Olivier Audemars, vice president of Audemars Piguet’s board of directors, said that the newly unveiled lounge concept marked continuity in the brand’s relationship with artists that shared similar levels of artisanal quality and craftsmanship. “Our partnership is a natural fit given Fernando’s technical mastery, skillful precision and dedication to creatively presenting the natural world around him,” Audemars was quoted as saying. The lounge was opened at Art Basel Hong Kong in late March, but it will show up again at the upcoming Art Basel in Basel, Switzerland, and Miami Beach, United States.